Our Lady Help of Christians Church in Port Richmond. Five parishes in Philadelphia’s Port Richmond section will reorganize in a plan that calls for merging and partnering, a new model whereby most of the parishes’ identities will remain. Parishioners in the area learned of the news at Masses over the weekend, Jan. 23-24, presumably after digging out from 18 inches of snow in the city. Of the six parishes in Pastoral Planning Area (PPA) 570 in Port Richmond, five are affected by the initiative announced this week. They will be reorganized in two phases. The first calls for Our Lady Help of Christians Parish, founded in 1885 for German Catholics in the area, to merge with Nativity B.V.M. Parish, and for Mother of Divine Grace Parish to partner with St. George Parish. The phase is to be completed by June of this year. Phase two of the initiative will be completed by June 2017 in which the new Nativity Parish partners with Mother of Divine Grace and St. George. An archdiocesan statement described a parish partnership as one in which the parish churches remain open and each parish retains its own finances and finance council. But to better manage resources, one priest pastor, one pastoral council and one parish staff serve the needs of all the parishes in the partnership. For instance in PPA 570, by June 2017 one pastor, one staff and one pastoral council will serve Nativity, Mother of Divine Grace and St. George parishes. All will remain open. St. Adalbert Parish, which had joined in the planning process with the other parishes in Port Richmond, will remain a free-standing parish with its own pastor, staff, councils and finances. St. Anne Parish was not involved with PPA 570’s planning and remains unaffected. The process of strengthening parish life in the Archdiocese of Philadelphia began more than five years ago, in the fall of 2010. Pastors, parishioners and an Archdiocesan Strategic Planning Committee have discussed recommendations for achieving parish growth and sustainability for the Catholic community in a given area. The planning process has resulted in 48 fewer parishes in the archdiocese today, as dozens of parishes have merged especially in densely populated urban areas. Port Richmond typifies some of the most difficult challenges pastors and parishioners engaged in the process face when trying to decide how to manage large physical plants and dwindling resources in the decades since the parishes’ founding. One of the most critical needs is staffing parishes with a declining number of available priests today and in the future. Geographically Port Richmond covers the river wards in lower Northeast Philadelphia along I-95 and the Delaware River, at one time home to bustling factories and burgeoning Catholic neighborhoods. While the Catholic population is smaller than in decades past, the parishes, churches and schools those communities built remain. Three of those churches — Our Lady Help of Christians, Nativity and St. Adalbert — sit within seven blocks of one another on Allegheny Avenue. All three grand churches might each be considered a cathedral in any other diocese. A distance of only 1.2 miles separates Mother of Divine Grace Church in the south of the area from St. George Church in the north, with four others in between. In years past each parish ran its own Catholic school. Today St. George and Mother of Divine Grace each have a school, and Our Lady of Port Richmond is a regional school at the St. Adalbert campus. Port Richmond also hosts ethnic enclaves, or at least used to: Polish Catholics still support St. Adalbert, but Our Lady Help of Christians no longer celebrates a Mass in German among its two weekend Masses for 278 people, according to the latest weekend Mass count. 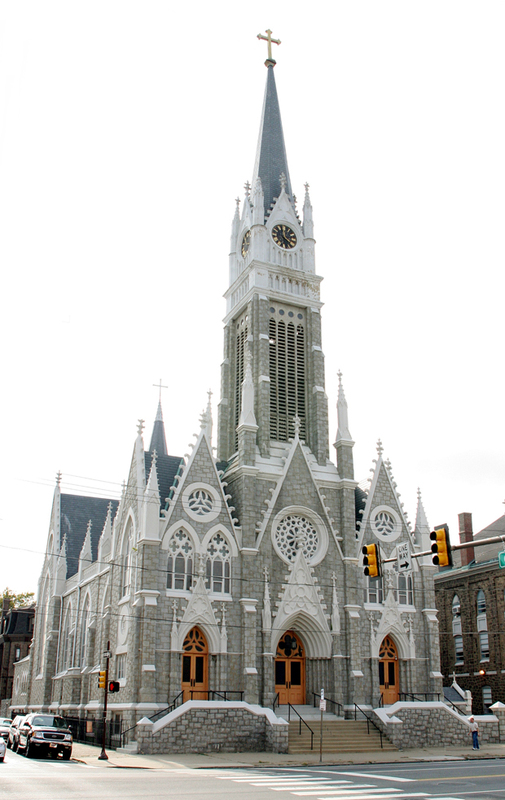 The many factors such as large, underutilized churches and other buildings, shrinking congregations and diminishing financial resources were studied by the Port Richmond parishes beginning in October 2014. After a year of discussion parish leaders and parishioners failed to come to an agreement on a path forward, so last October they met again to consider the partnership option. They eventually settled on it and recommended it the Council of Priests and to Archbishop Charles Chaput, who accepted the plan. I have a question regarding Our Lady Help of Christians church and Nativity BVM church consolidating. Is anyone even thinking about trying to make revisions at Nativity BVM for someone, like me, who is permanently confined to a wheelchair and who cannot attend church services because of the steps? Life is hard enough, without having to start over or having to go a further distance, making attending Sunday services more difficult! I attended school at Our Lady Help of Christians, I made all my sacraments at Our Lady Help of Christians and, after becoming permanently disabled and confined to a wheelchair, I was even able to be a part of the OLHC adult choir, when the outside wheelchair lift was working and it felt great! It made me feel so good about myself, knowing that I was part of something wonderful, especially when we sang at church, during the Holidays. But now that the outside wheelchair elevator at OLHC has been out of commission since November, costing too much to fix, and with both churches consolidating, I have had to give up what I enjoyed the most, singing in the choir, and I haven’t even been able to come to my own Parish on Sundays, with everyone I am so familiar with and have always looked forward to seeing. It just seems like the disabled parishioners, along with the elderly, who cannot climb steps, have been forgotten! I do understand all too well what it is, not to have a choice, or to hear the words, “my hands are tied”, but there has to be something someone in the Catholic services office or Archdiocese can do to help us, the disabled population and the elderly, to be part of a congregation, once again, that made me feel so proud to be a part of, while providing comfort and familiarity in an otherwise difficult situation!! Please shed some light on what will happen when the churches merge! Thank you so much for your time and consideration in answering my question. Mother of Divine Grace Parish also operates a school. What does the merger of Our Lady Help of Christians with Nativity accomplish? The two parishes already share the same pastor. Sounds like a death nell for a beautiful parish. Yeah, I’m not too sure what merging two already twinned parishes does. Seems to me that both churches will operate continuously, but one as a parish church, and one as a chapel. The two options they came up with are entirely too complex and bound for failure. Option 1 should have been to partner the three Allegheny avenue parishes together,have the pastor work out of the central parish, Nativity. Then Parter St. George and Mother of Divine Grace. Option 2 should have been either to completely shutdown Our Lady Help of Christians and Nativity, and send them to St. Adlabert, and then partner MOther of Divine Grace and Saint George. I too wonder the same thing. I would have thought they’d just include Help of Christians in the partner plan, which would have made more sense, than just make it a worship site. Mother of Divine Grace operates a parish school. So is Our Lady Help of Christians being relegated, or is it remaining a worship site? OLHC will remain a worship site for weddings, funerals, christenings, etc. The daily and weekly masses will be held at Nativity. The building isn’t closing or getting condemned.